My top, boven 5 Panic At The Disco songs; which is your favorite? My top, boven three favoriete songs from the album "Fever", your favorite? Panic! at the Disco, The Game, Big Sean, Lil Jon, plus meer than 20 other rock, hip-hop and electronic muziek stars and up-and-coming artists will be descending on oranje County for the premiere of the Playground Festival, hosted door multi-threat media ster Nick Cannon. The eight-stage event will take place Labor dag Weekend, Sept. 3-4, at Hidden Valley, Irvine, Calif., volgende to the Verizon Amphitheater. There also will be a laser-tag arena, carnival rides, Southern California’s famous food trucks and more, including DJ and performer competitions. 1. u laugh at everything they say/do even when no-one else thinks it's funny. 5.You annoy everyone around u when u talk about them. 6.You're convinced that u are going to marry one of them(even if they don't know it yet). 1. u draw a watch on your arm pointing to 9 o'clock and label it "nine in the afternoon". 2. u spend hours on YouTube watching muziek videos, interviews, videos of them live, etc. 3. Whenever watching zei live performances, u constantly wish u were in the crowd of if u have sen them live, u look for yourself in the audience. 4. u have dressed up/plan to dress up as Brendon Urie of Ryan Ross for Halloween. 5. u know all the band members' (current, former, touring, etc.) full names and birthdays. Let me save u of this wrong. Count me away before u sleep. Oh, memories, where’d u go? u were all I’ve ever known. But according to Ross, the spleet, split had been in the cards for sometime now. It just took everyone a while to realize it. mypanicatthedisco.com will provide u information about panic at the disco, forum page, gallery, latest news and blogs, downloadables and videos. It's all u need to know about panic at the disco and exclusively for you, fans out there. a comment was made to the poll: Who is your favoriete Panic! member ? 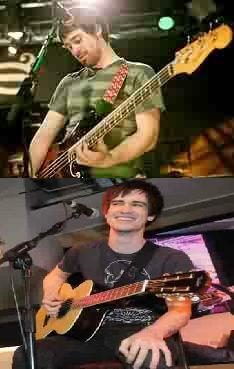 For which Panic song do Jon and Brendon switch instruments? New icoon & Banner Submission Forum!